I have another restaurant post for you today! 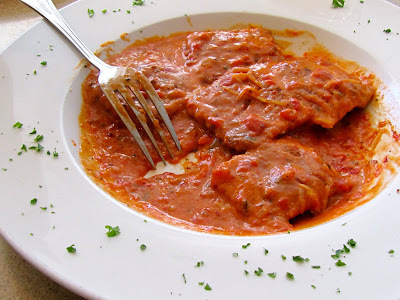 B and I went to Strings Italian Cafe when he was here, and here's what we ordered! Here's the Strings website. We went to the Folsom location, because I had a coupon, but normally I go to the El Dorado Hills location. When you order an entree you get a choice of either a salad or soup and you also get bread (which is amazing!) I always get the house salad, which is topped with sweet raisins and sunflower seeds. B got the Caesar salad, which was also tasty. I love their bread because it's great on it's own, or sopping up the rest of your pasta sauce with. This is partially why I order my lasagna pastry sans meat sauce and all Alfredo sauce instead. I am not a big fan of their meat sauce, it's kind of bland, but their Alfredo sauce is amazing! Garlicky, creamy and great with the bread too. I've never tried what B ordered, but the sauce was also delicious with the bread. He scarfed all his raviolis before I even got a chance to ask for a bite, but I think it was also good. The sauce was a spicy tomato cream sauce, and I almost couldn't decide which sauce was better. 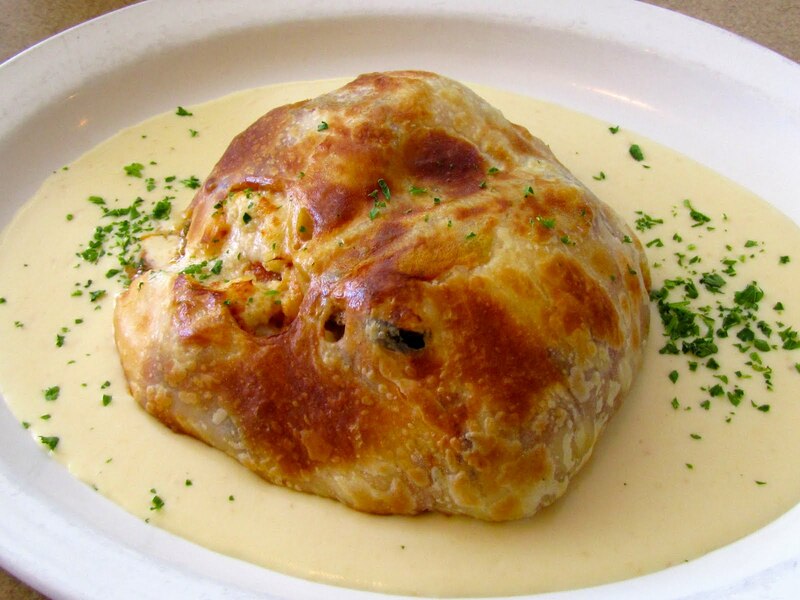 My dish was basically a lasagna cooked inside an onion, garlic pastry. The lasagna I had at the Folsom location seemed a little undercooked on the inside, which was strange since every time I have ordered it at the El Dorado Hills location, it's been cooked to perfection. I love the originality of some of the dishes at this restaurant, it's Italian food, with a twist. I also love that the entrees are not too large, but they give you endless bread. So you're full no matter what you order, and you can use all the bread to dip in your pasta sauce. It's usually pretty slow if you go during off times, which is most of the week. So, waitresses are attentive and refill your drinks and bread fairly quickly. If you haven't been to a Strings restaurant near you, go there and order one of their amazing dishes!